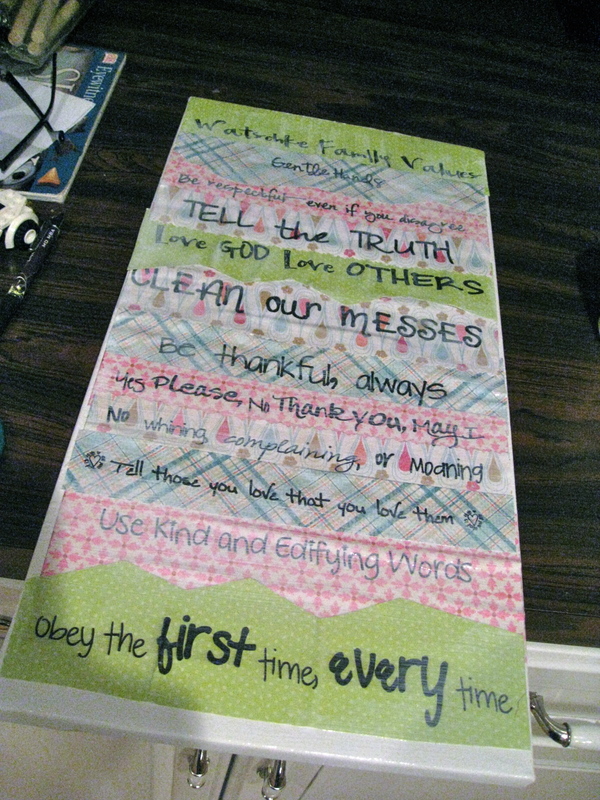 So I told you that I'd put a tutorial up on how I made my Family Value wall hanging. The idea did not originate from me, however I did do it a little differently (I think my way is much easier-you be the judge). I first got the idea from a guest blogger on The Pleated Poppy. I thought it was a great idea but was a bit too large for my taste. I spent less than $10 bucks on this. 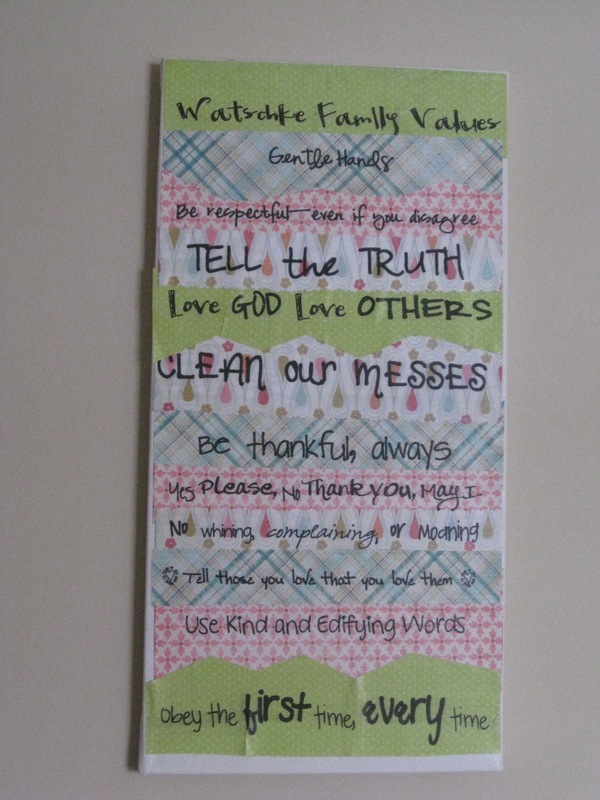 First Step: Write down your family values. You can do this with the kids. It's pretty fun. Second Step: Cut your 12x12 paper to 8.5 inches wide so that you can use it in your printer. Just hold up a piece of printer paper to it and cut along the line. Third Step: Type your values into word. See how they look with different fonts. I downloaded a TON of free fonts from here... The fonts all look handwritten and they are SUPER fun. I LOVE FONTS. Fourth Step: Print your values onto the paper! Sixth Step: Lay your pieces onto the canvas and arrange them in a way that you like. You will have to trim the sides so that they line up with the canvas, too. Seventh Step: Carefully slide the paper off the canvas. Eight Step: Pour Mod Podge (a lot!) onto the paper plate. Use your sponge brush to spread it all over the canvas. Ninth Step: Place your paper onto the mod podged canvas. Use your hand to smooth out the paper as air bubbles like to get stuck. Tenth Step: Spread a layer of mod podge over the entire piece. Use a lot. Spread it evenly. Make sure to check for drips along the sides. 11th Step: Let dry and do it one more time. THAT'S IT! 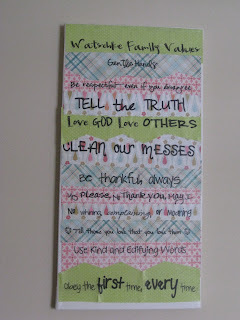 Beautiful and rewarding family values wall hanging. Please send me a pic if you make one. I made some more using the same process. I'm going to try to sell custom name canvas on Etsy! Love them! Tell me what you think. Eek! So exciting. Thank you! i really like this one! i may have to make one like it :) thanks for sharing on my blog! these are seriously lovely and easy to do - guess what i'll be doing tomorrow with my son! !